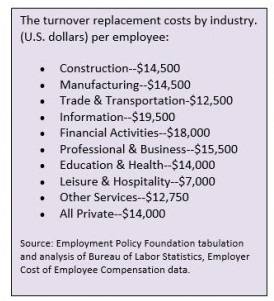 Wiki says that the cost of employee turnover can be 150% of your salary expense. It is one of those hidden costs one does not focus on. These include costs due to person leaving, recruitment costs (both internal and external), Training costs, Lost productivity costs, hiring costs and potential loss of sales or loss due to poor customer contact and internal teamwork. Evoloshen, who specialises in employee churn, states the ROI on employee development therefore could be anywhere between 30 to 7000%. The number can be huge, enough for you to investigate. In India, for example if you took the salary at Rs 1,00,000,and the replacement cost as Rs60,000, and if you lost 50 employees a year your cost would be a minimum of Rs 30,000,000. So, preventive measures are required. You should think of adding value to your employees, over the value they can get at some other company. What do employees value? Is it just the salary, the ambience, the company, the experience they gain, how marketable they are because they work for you, training and educational opportunities, growth opportunities etc. Is your company better at this? Do your managers think of employee value or meeting their goals. Is reduction of churn a goal? Are your managers value creators? This entry was posted on October 7, 2013 at 10:37 am and is filed under Business & Management. You can subscribe via RSS 2.0 feed to this post's comments. You can comment below, or link to this permanent URL from your own site.